Jason Mraz was the support act for tonight’s show and garnered a large fan club after his short but wonderful set. The southern Californian sings and plays acoustic guitar and is backed up by acoustic bass and extraordinary percussionist Toca Rivera. The young man is a natural performer, a natural songwriter and charming to boot. He is destined to go along way if tonight’s set is anything to go by. The audience warmed to the young man the moment he came on stage. A great voice and an equally great guitarist, this three-piece ensemble seemed like the sound of a thousand men. Certainly an artist to look out for. Tonight’s gig by Tracy Chapman was the second of two nights at the Royal Albert Hall. An audience of all ages excitedly waited in anticipation for Chapman to grace the stage. It has been quite a few years since the singer has had any real chart success but the audience were incredibly excited and in full voice for the performance. Chapman came onto the stage to deafening cries from the audience; her tall figure draped in dreadlocked hair is a far cry from the young Chapman that we remember from years back. Her voice sounds as good as ever if not better, her songs have not lost their edge. The anger, sadness, happiness, protest and defiance still remains. The production and arrangement is minimalist – paired down into a small but clever package. A great band full of energy and subtlety surround her happy to support her every requirement and carry the night through. The classic tracks naturally bring the biggest cheers but it seems that the audience are as knowledgeable and enthusiastic with her new material as they are with her early work. ‘Talkin’ Bout A Revolution’ and ‘Give Me One Reason’ amongst others are received with unabated euphoria from this mixed age audience. Chapman’s version of Bob Marley’s ‘Get Up Stand Up’ finds the audience in full voice. Chapman’s latest album ‘Let It Rain’ continues in her melodic and melancholic manner producing such tracks as ‘Another Sun’ and the title track ‘Let It Rain’. She is happy to communicate with the audience in her almost shy and reticent manner. She talks as if she is telling a story over a fence in the back garden, certainly not aware that in fact this is a sold out gig at the Royal Albert hall, every seat, floor, level and box full to capacity. 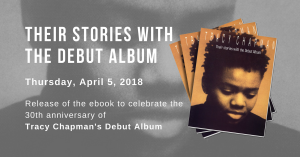 Tracy Chapman still has an air of authority about her, an authority that despite her shyness forces you to keep you eyes and ears fixed on her and her music. Her voice is full of clarity and depth; her guitar playing is simple but effective. For an artist who has first appeared on the scene in 1988 with her multi-million selling, Grammy award winning album, it seems that fifteen years doesn’t change that much after all. MONXENA, 03/12/03: I was only 16 when I remember first hearing Tracy even before the famous AMNESTY Concert appearance back in … was it 1987? I bought her LP the day after I heard her and haven’t looked back since (which I have since replaced with a CD). I have been to each of her concerts in London and one in Texas in August 2000. It has been fascinating to see how she has become more and more confident and relaxed as the years pass. The first concert she played in London, if I remember correctly she must have spoken to the audience only twice. Eventually cries from the audience like “Tracy – speak to us” were all too common. It was possible to see how Tracy fell deep into her music when performing, almost oblivious to her admiring audience. However, time has passed and Tracy has grown so it was a very different experience (yet still as pleasing) to see her most recent concert on 12th March in London. Tracy spoke, smiled, joked, laughed and danced… don’t get me wrong, she hasn’t lost that air of mystery, but this time it was so, so apparent that she too was enjoying the performing infront of us. My friend and I left the concert feeling as if we were drunk with emotion…. Definitely Tracy’s best London concert yet…! Just one last thing – who were the women in front of me – they were so moved by Tracy’s music that they spent most of the evening crying (both tears of sadness and happiness). NICKWYER, 03/12/03: I was lucky enough to see Tracy at the Royal Albert Hall on the 12th of March, i was 4 rows from the front, and was totally transfixed from begining to end. I have seen some pretty good concerts in the past, including Madonna, Inxs, Alanis Morrisette, Rolling Qtones to name but a few, but none of these came close to the performance from Tracy, her voice was so hauntingly beautiful, she had incredible humility, and she seemed so be enjoying it as much as we were. It`s an experience i will never forget, I went with my 10 year old daughter, (who is a huge Tracy fan herself) and she was totally blown away. It was her first real concert she has been to, and she has talked about nothing since. If you ever get a chance to go, you would never regret it!